Last week, I had not just one, but three people share their cow sightings with me. I found all of them wonderful and I decided I shouldn’t keep them all to myself so I’ll be sharing them with you this week. I credit today’s cow sighting to Sarsm, who spotted these cows on the BBC news website. 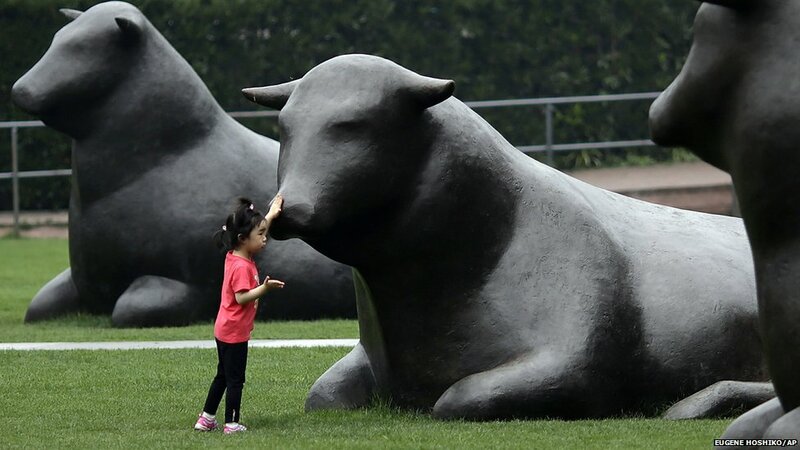 These giant cow sculptures are apparently a new attraction in Shanghai, China. Aren’t they beautiful? Should I add I’m really glad that real cows aren’t that big? Previous Post Don’t know what to make with clay? How about a cow? Next Post Today’s cow got… udder rings? Cows in repose–how comforting. Cows and cats are such relaxed, and relaxing, creatures. They do look very relaxed, don’t they? And I really like public sculptures the public can actually touch. Have you seen the cattle drive in Dallas? Thanks for sharing! I didn’t know about this but now I’ll have to write a post about it. Greetings! You’ve been nominated for the Versatile Blogger Award. Should you choose to accept, please go to https://towriteistowrite.wordpress.com/2012/06/11/versatile-blogger-award-1st-random-disclosure-1st-nomination/ to read all about it. Thanks, Kathy! I’m glad you’re enjoying reading about my cow sightings, which need stop surprising me. I’ve got quite a few very funny cows to share, probably sometime next week. One of them is quite shocking, in a funny way. Driving around with a camera seems pretty simple, but it really isn’t in real life. I have the same issue where I get to witness beautiful (or not so beautiful) things and I have to rely on my phone camera to capture the moment. But now, I can’t wait to see your German cows!